Israeli salad (Hebrew: סָלָט יְרָקוֹת יִשְׂרְאֵלִי‎, translit. 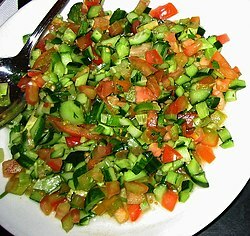 salat yerakot yisra'eli, "Israeli vegetable salad", also known as Arab salad) is a chopped salad of finely diced tomato, onion, cucumber, and bell or chili peppers. It has been described as the "most well-known national dish of Israel", and is a standard accompaniment to most Israeli meals. Salads following essentially the same recipe, with different names, are widespread and popular throughout the Eastern Mediterranean. It was adopted from local versions by Jewish immigrants to the Levant in the late 19th century. The name Israeli Salad is used mainly outside of Israel. In Israel, it is commonly referred to as salat katzutz (Hebrew: סָלָט קָצוּץ‎, "chopped salad"), as well as salat aravi (Hebrew: סָלָט עֲרָבִי‎, "Arab salad"), or salat yerakot (Hebrew: סָלָט יְרָקוֹת‎, "vegetable salad"). Palestinians may call their traditional dish salatat al-bandura or salatat banadura ("tomato salad"), or salata na'meh. Israeli salad is made of chopped raw tomato, onion and cucumber, and can also include pepper, carrot, scallion, leafy greens and parsley. The salad is dressed with either fresh lemon juice or olive oil, or both. Za'atar and yogurt are very common dressings at breakfast while sumac and tahini are common the rest of the day. Generally, the cucumbers are not peeled. The ability to chop the tomatoes and cucumbers into the "finest, most perfect dice" is considered a mark of status among many kibbutz cooks. Traditional recipes do not include lettuce. In Israeli restaurants and cafes, Israeli salad is served as an independent side dish, as an accompaniment to main dishes, or stuffed in a pita with falafel or shawarma. It was part of the traditional Israeli breakfast at home before Western-style breakfast cereals became popular, and remains a standard feature at buffet breakfasts at Israeli hotels, as well as in many homes. Although cucumbers have an ancient history in the Middle East, tomatoes, native to South America, were not cultivated in the Syria region until possibly as late as the 19th century, during the Ottoman Empire. The origins of the Israeli salad are traced by Gil Hovav, Israeli food editor and chef, to a Palestinian Arab salad. He states that, "this salad that we call an Israeli Salad, actually it’s an Arab salad, Palestinian salad….” The idea that what is known in New York delis as "Israeli salad" stems from a Palestinian rural salad is also agreed on by Joseph Massad, a Palestinian professor of Arab Politics at Columbia University, as an example of the appropriation of Palestinian and pan-Syrian foods such as hummus, falafel, and tabbouleh by Israel as "national dishes". Food historian Gil Marks describes how Jewish immigrants in the late 19th century first encountered the cucumber and tomato salad in then-Ottoman Palestine, and traces its presence there back to the Turkish çoban salatası (shepherd's salad). Adopted and popularized in Israel by the kibbutzim, variations on the basic recipe have been made by the different Jewish communities that immigrated to the country. For example, Jews from India prepare it with the addition of finely chopped ginger and green chili peppers, North African Jews may add preserved lemon peel and cayenne pepper, and Bukharan Jews chop the vegetables extremely finely and use vinegar, without oil, in the dressing. Other similar chopped salads found in the Middle East, include the Persian salad shirazi سالاد شيرازي (which includes mint, diced onions, and peeled cucumbers), and the Turkish çoban salatası; among others found throughout the eastern Mediterranean area in Turkey, Lebanon, and Egypt. The Indian subcontinent cuisine also includes a variant of this salad, called "kachumber". ^ a b c d e f g h Marks, Gil (2010). Encyclopedia of Jewish Food. John Wiley & Sons. ISBN 9780544186316 – via Google Books. ^ Claudia Roden (1996). The Book of Jewish Food: An Odyssey from Samarkand to New York. Knopf. p. 248. ^ a b Levy, Faye (May 28, 1992). "A Salad for This Season". Los Angeles Times. ^ "Tasty Israeli Salad". Israel Food Guide.com. Archived from the original on 1 February 2009. ^ Farsoun, 2004, p. 138. ^ Wright, Clifford (8 May 2012). Mediterranean Vegetables: A Cook's Compendium of All the Vegetables from the World's Healthiest Cuisine, with More Than 200 Recipes. Houghton Mifflin Harcourt. ISBN 1558327754 – via Google Books. ^ Nasser, Christiane Dabdoub (10 July 2013). Classic Palestinian Cuisine. Saqi. ISBN 9780863568794 – via Google Books.